Dog Grooming at Double-C . . Big and Small . . We Groom Them All! 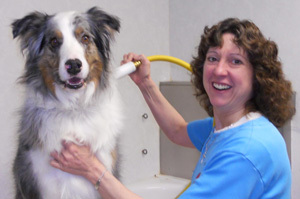 Simply the best team of professional dog groomers can be found at Double-C! The groomers at Double-C are gentle, kind, positive, caring, calm and skilled. All Double-C groomers take great pride in their work. Their positive personalities, dedication to quality grooming and love for the dogs, make them an outstanding team. They form attachments and relationships with each of their K-9 guests. Many dogs return every 4 to 8 weeks for regular appointments. Dogs LOVE Double-C! The grooming department has the latest professional grooming tools and products. With the comfort and safety of our grooming guests a priority, Double-C has spacious exercise yards and climate controlled guest rooms with raised beds, hydraulic grooming tables, plus a full line of quality products. Because the groomers do take extra time with each dog, it’s a gentle, relaxing, individual process that every dog enjoys.